Old Soviet Victory Day postcard. The soldier is writing on the wall, “Victory, May 9, 1945”, the text on the bottom reads, “I remember…I am proud…” and the medal is inscribed with the word, “Glory”. Today, Ukraine and many other post-soviet countries celebrate their 1945 victory over Nazi Germany in WWII or as it is commonly referred to here, The Great Patriot War. This is considered one of the grandest and most important holidays for many Soviet Russians. Recently it has become a more somber event because the number of veterans commemorated each year is drastically decreasing. In my town of Romny, we lost almost half our veterans this year. Only ~20 were present at our memorial event. 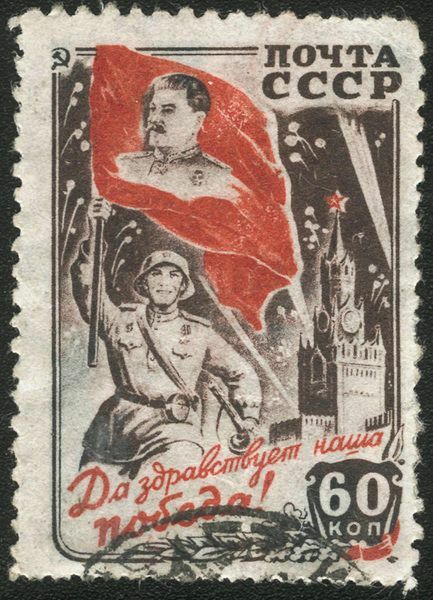 SSSR 60 cent stamp commemorating the victory with a soldier waving a flag with Joseph Stalin. The text reads, “Long live our victory!”. There are many symbols that are seen during these memorial events. One of the most prominent is the orange and black striped St. George’s ribbon. This ribbon is often worn on clothes and affixed to cars as a sign of respect and remembrance. The pattern was designed to symbolize fire and gunpowder and is one of the most recognized symbols of military valour in WWII. It was conceived from the Order Of St. George established in 1769 by Catherine the Great as the highest military decoration in the Russian Federation. Red Carnations are often seen at the memorial events to symbolize the red of the Soviet flag and blood of the fallen soldiers. They are always placed in an even number at graves or memorials to symbolize mourning and rememberance. An odd number of flowers always symbolize a celebratory event. Lastly, the Red Star Medal is a military distinction for bravery. Most memorial events conclude their services with a parade to their eternal flame. Nearly every WWII memorial has an eternal flame near a group statue of soldiers. Eternal flame of Mamayev Kurgan, Volgograd (formerly Stalingrad) in Southern Russia. Protector of the Motherland Statue of the WWII memorial in Mamayev Kurgan, Volgograd (formerly Stalingrad) in Southern Russia.